Wanting to reduce the hand labour in the N-2, director Schmitt approached VDM, who could form aluminum panels "as long as they're round, curved shapes". Stevenson designed the bulbous shape in 10 days in June '53. Nearly the entire run of S-1 Fuldas was built by NWF under license, using Ilo motors. The S-2 was Fulda-built, using the old Sachs 360 once again. The two S-3 prototypes tried out the new Sachs 200 (Messerschmitt) motor. 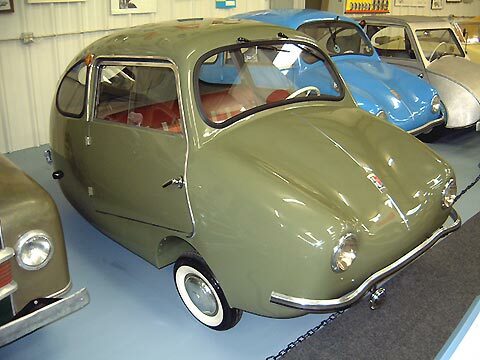 The S-4 was built in response to the 1955 elimination of the tax advantage previously given to three-wheelers. The reversible Sachs motor drove a pair of rear wheels, spaced 400mm apart, via a custom enclosed chaincase, thus enhancing stability. Front suspension was a multi-leaf transverse spring with no shocks. The rear deck still came up to the back of the front seat. The wiper motor was moved to above the windshield, and the sunroof was now the normal Isetta type. Pictures seem to indicate that the bullseye rear window had grown somewhat over the NWF. The Fuldamobil S-6 received a redesigned front suspension consisting of a single transverse leaf spring combined with a pair of coil-over shocks. It is also distinguishable from the S-4 by the small bench rear seat. A single rear wheel was also available, as was an optional full-sized rear window. This car features the optional three-piece floor mats. The mirror was supplied by Witte. This example's chassis plate says S-4, but apparently that was simply retained to avoid a government application for a new type designation and the accompanying bureaucratic hassle. The car features upholstery made from new-old-stock '50's plaid material. Weight: 375 kg Electrics: 12 v 4 Wheels: 4.00 x 8"